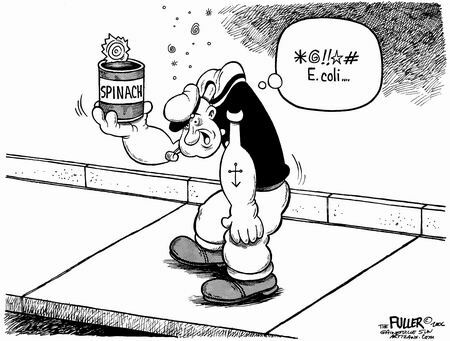 As the U.S. recalls bagged spinach due to an E. coli scare, Popeye The Sailor Man is in a state of total panic. Friends are trying to get him interested in carrots, but so far it's a no go. "How can I live without spinach?" he asks. "It's part of my persona. I draw all my strength from it." Poor Popeye is quiet, inactive, sad and depressed, confident that he will become a total wimp without that very special green fuel that keeps him going. Equally delighted to hear about the recall was Suzy SpinachHater of Westchester, New York. She complains, "I'm only eleven years old, and I already must have heard 'eat your spinach' from my mom at least a million times. How boring is that? Enough already." Suzy says she's usually disgusted with the government but now she feels differently. "I mean, to hear the government say 'don't eat your spinach,' how cool is that? Right on man, right on." Norman NoSympathy, Executive Director of The Broccoli Growers of America, has issued a statement stressing all the safety precautions BROCCOLI growers take to ensure the safety of their very nutritious product. In public, he's expressed sympathy for the producers of spinach. Privately, he's indicated to friends, "Yippee! Now broccoli will get the market share it deserves." An investigation continues as to what caused tainting of the spinach. There's the possibility that it wasn't an accident. No official suspects have been named. However, Spoof spies report that Olive Oyl, Sally SpinachHater, and Norman NoSympathy are definitely considered "persons of interest" in the investigation.